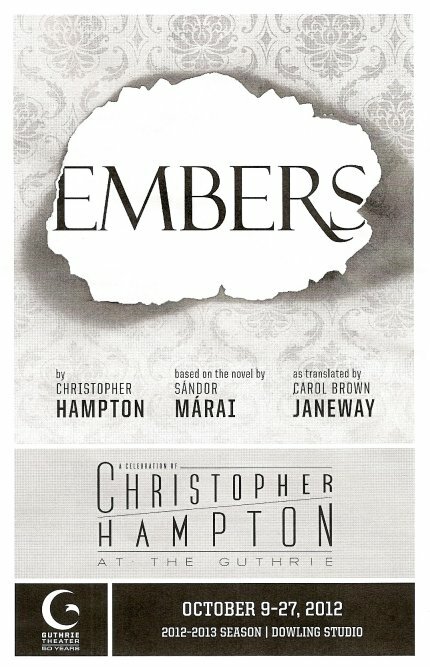 Embers* is the second of the three Christopher Hampton plays currently running at the Guthrie that I've seen, following the historical drama Appomattox a few weeks ago. An adaptation of the 1942 novel by Hungarian author Sándor Márai, Embers revolves around an intense but fractured friendship between two men. Something happened 41 years ago that caused Konrad to abruptly leave the Hungarian town where they lived and served in the military, and Henrik is now, at the end of his life, determined to get the truth. I don't want to say too much about the plot because it's fascinating and suspenseful to watch it all unfold, but the event that caused these two friends to separate involves a woman (naturally). Henrik and Konrad grew up together, and loved each other as brothers, but it seems there was always a bit of tension in their friendship. Henrik was born to a wealthy family, while Konrad's parents struggled to give him any advantage they could. Henrik married Krisztina, but Konrad loved her too, and perhaps she loved him (in many ways it's very similar to the Rick/Shane/Lori story on Walking Dead, yes I just compared a 20th century Hungarian novel to a TV show about zombies). All of these complicated feelings boiled over on one day 41 years ago. Konrad left town without a word to anyone, and Henrik and Krisztina's relationship was irreparably damaged. Henrik invites Konrad to dinner at his castle in an attempt to settle things once and for all. This is a three-person cast, but at times it feels like a one-man show. 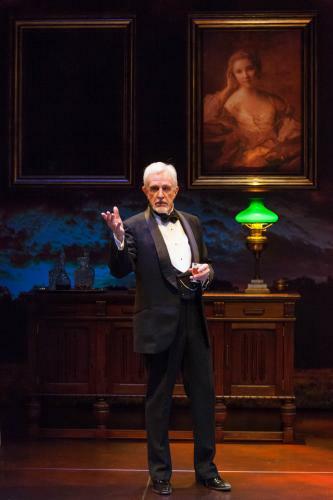 James A. Stephens gives an utterly captivating performance as Henrik. It's a thrill to listen to the words come out of his mouth in these long philosophical monologues, as he elegantly paces around the room in a tux with his after dinner drink in his hand. Nathaniel Fuller's Konrad mostly listens and evades the questions, giving a sense that the past is still too painful to talk about or even acknowledge. Guthrie stalwart Barbara Bryne makes a brief appearance at the beginning and end of the play as Henrik's devoted servant. There's very little action in this play, it's mostly just one or two people sitting in a room talking. But in this case that's a good thing. And it's a beautiful room - the Dowling Studio (whose namesake, Guthrie Artistic Director Joe Dowling, directs) is set up in the round, which I've never seen here before. A few pieces of imposing furniture are in the space, with a fireplace on one end and large portraits on the other. 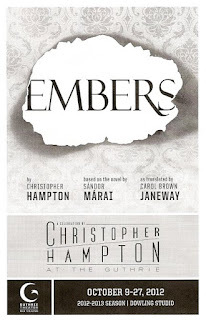 Embers is the smallest and quietest of the three Christopher Hampton plays - Appomattox and Tales of Hollywood have large casts, fancy sets and costumes, and plots that cover long time spans. This is basically a story about the relationship between two people, with the events of the play taking place on one long evening. It's a nice complement to the other two, playing now through October 27. *I received two complementary tickets to Embers as part of the Guthrie's Blogger Night.